Turquoise is a beautiful and captivating stone and is one of the official birthstones for December. Turquoise is know for aiding in communication, encouraging enthusiasm, inspiring new projects and undiscovered artistic abilities. 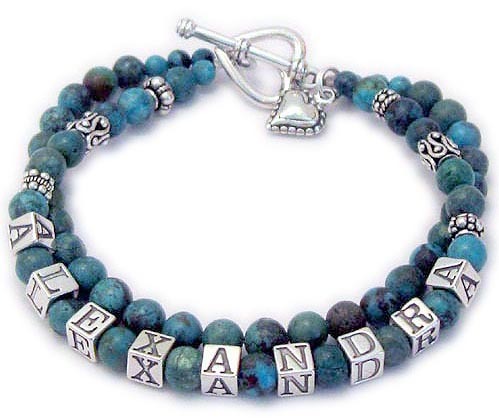 Turquoise is also know to attract success and prosperity in life. Turquoise ranges in color from blue to green to yellow and is filled with wonderful patterns of brown and black matrix that are composed mainly of copper deposits. 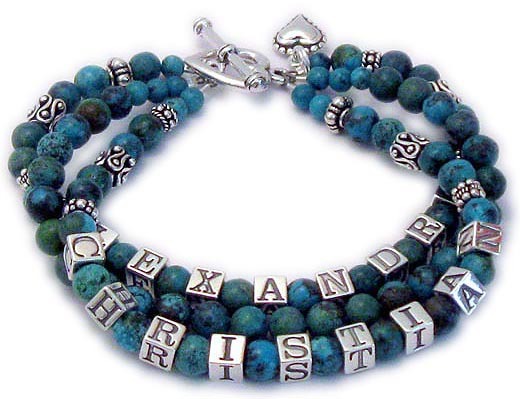 Our turquoise has been stabilized for strength to be used in bracelets, earrings and necklaces. *I have a 3-string with 3 names shown above. If you scroll down you will see 1 and 2 string bracelets. You may have up to 5 strings. 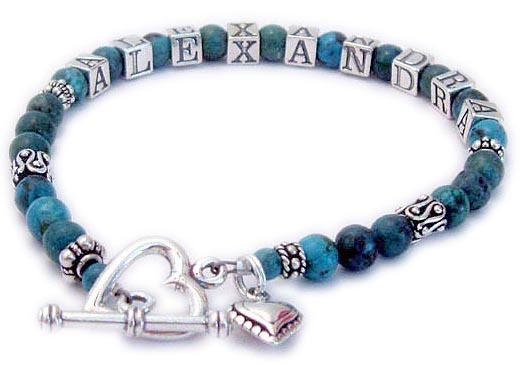 This bracelet is shown with 2 names (Alexandra and Christian) and a middle string with no name. They upgraded to a Heart Toggle clasp and added a Beaded Heart Charm. You may add charms and other fun things during the ordering process. Call or email me with questions or to order over the phone. Shown with an add-on Heart Toggle Clasp and a Beaded Heart Charm.